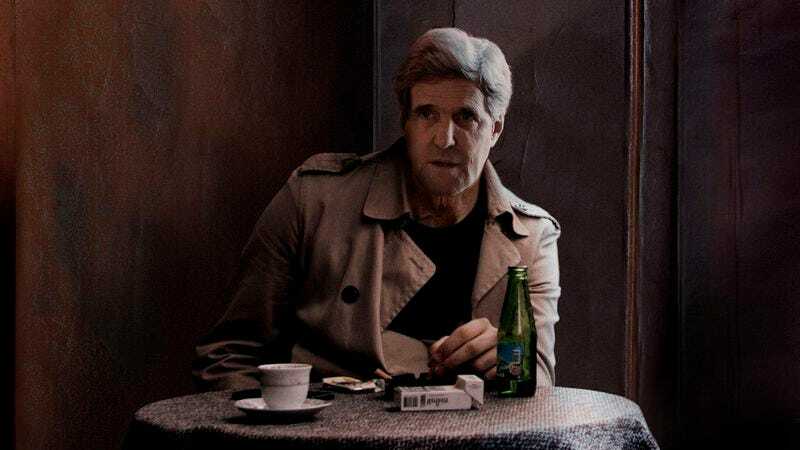 KIEV, UKRAINE—Following his overnight arrival in Ukraine amid the escalating regional tensions over the the Crimean peninsula, sources confirmed seeing U.S. Secretary of State John Kerry wearing a trench coat and cloaked in shadows at the back of a seedy, smoke-filled Kiev café Tuesday while reportedly awaiting a woman known to him only as Dasha. “All I know is that my contact goes by the name Dasha, and from the dossier I was given, she’s extremely beautiful, deadly, and not keen on making my life easy,” the United States’ top diplomat was reportedly overheard saying between drags of a pencil-thin cigarette held between his pursed lips. “The one thing I do know is there isn’t a chance in hell this secretary of state leaves Kiev without first making nice with Dasha. No, one way or another I need Dasha, and not just because she’s a mysteriously alluring beauty who’s been known to seduce her share of foreign ministers. I mustn’t underestimate her cunning and intelligence either—let’s just say this is a woman who knows a thing or two, particularly about the socioeconomic realities of eastern Europe and the political divisions among the ethnic populations in the region.” At press time, Kerry had reportedly detected the unmistakable scent of rosewood and nightshade, Dasha’s signature perfume.